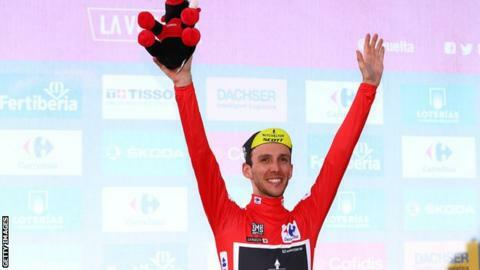 Vuelta a Espana leader Simon Yates and his twin brother Adam will lead Britain's men's team at the Road World Championships, but Geraint Thomas and Chris Froome will not be taking part. Tour de France winner Thomas and Giro champion Froome were on the longlist but British Cycling said their withdrawal was a "mutual decision". Commonwealth bronze medallist Dani Rowe is part of the women's road race team. The Championships take place in Austria from 22-30 September. "Froome and Thomas are obvious omissions from the men's team, and this was a decision we made mutually," said British Cycling performance director Stephen Park. "Given the challenging nature of the course, we want every rider selected to be able to give their 100% to the team, and on the back of what has been an incredible season for both, it's understandable they are unable to commit to this." The elite men's road race features more than 5,000m of climbing over a distance of 265km. They will complete seven laps of a 24km Olympic Circuit which has a climb with a gradient of 25% in places. The women's race will follow the same route, also finishing in Innsbruck, but they will complete just three laps of the circuit for a race distance of 162.5km. Simon Yates has enjoyed a breakthrough season in 2018. The 26-year-old leads the Vuelta by 33 seconds at the start of Wednesday's stage 17 , while in May he led the Giro d'Italia for 13 days and won three stages before cracking on stage 19 as Froome produced a sensational ride to secure victory.